Sometimes the most basic formulas are the most effective when it comes to cleaning. For example, many homemade cleaners are made with only 2 ingredients (yes, two!) And you probably have them in your pantry right now. Next, we give you a list of the two ingredients you can mix to clean your entire house. The next time you have to scrub the residue of baked goods, sprinkle baking soda on top of your dish detergent to boost your cleaner and add more friction when washing. The baking soda is one of the ingredients to clean the most efficient and economical home as well. Clean the clogged sink with these two ingredients to clean the house: pour ½ cup of baking soda through the pipe and followed by ½ cup of vinegar. It will have the same effect as your science class volcano experiments, so cover it with a damp cloth and wait five minutes before you rinse it with hot water. When this ingredient to clean the house is combined with the liquid detergent, it helps to balance the PH levels of your clothes so that it is cleaner. Then the next time your clothes look dreary, add a cup of baking soda to your load before using the washer. 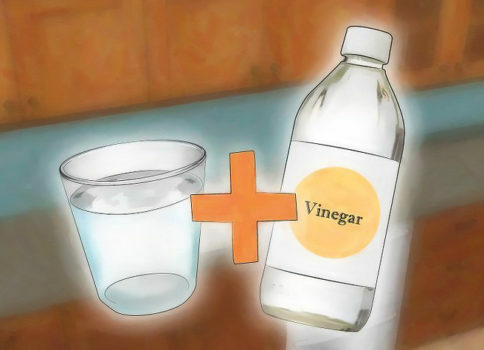 Those annoying rings of burnt fat that are left in glass-ceramic can be quickly removed with the following mixture of ingredients to clean the house: combine two equal parts of baking soda and toothpaste, use a damp cloth to gently rub the paste and continue until the ring disappears, then rinse. Mix these ingredients to clean the house to eliminate those annoying flies from your home: add 3 drops of soap to a cup of vinegar. The detergent will reduce the surface tension, so the flies will sink and drown. If you have a copper item that is tarnished, use this simple mixture of ingredients to clean the house: pour some ketchup on a cloth, and then sprinkle salt on top. Rub the mixture over the copper article and repeat until the entire surface has been covered. Rinse it and you will see that the result is brilliant. These ingredients to clean the house are safe to use even in delicate or vintage fabrics. Simply combine the lemon juice and salt and apply the mixture to the stain, then let it stand for half an hour. Rinse the garment with vinegar and warm water and put it in the washing machine as usual. These are keys to making a superficial cleaning of the house and to keep it clean. If you want to enjoy a clean house with your family, ask for a budget for thorough cleaning of flats and houses and enjoy your free time while we put your house ready for you to enjoy with your family.